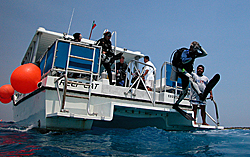 The Dive Center hours are from7:00 a.m. to 6:00 p.m. daily. the retail shop is open Monday – Saturday 8:00 a.m. to 6 p.m. Morning 2 Tank Dive trips leave our dock (weather permitting) at 8:30 a.m.. Diver must be ready to board at 8:15. Two dives are made and the boats return to the shop by lunch time around 1:00 p.m.
A very popular dive done at 3:00 p.m. is a one tank wreck dive done on the wreck of Felipe Xicotencatl. It’s a short ride out to the wreck which is resting in 80 feet of water very close to Chancanaab Park. The wreck has an interesting history and was once a commissioned mine sweeper for the U.S. Navy. A must for all the bubble junkies who can’t get enough diving. The twilight dives are great for seeing the reefs come alive as fish start their feeding taking advantage of the low light. We do one dive at dusk and a night dive for the second dive. Night diving in clear water is something you shouldn’t miss. If you think the reefs are beautiful in the day you must see them at night. Night dives are scheduled 3 times a week or any time we have a minimum of 6 divers. 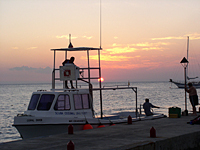 Wreck , Night , and Twilight dives are not part of our dive packages and have additional charges. Need to log some more hours U/W? Check out our shore diving. You’ll find plenty to see and photograph. Try an early morning dive or late night dive for some great marine life. The Dive Center closes at 6:00 p.m. daily.